Home > Custom Vampire Teeth > Now You Don’t Have to Find a Vampire Willing to Bite You! You know what looks real cheesy? Those plastic fangs bought from the local costume shop. These can seriously cramp your style, especially when you are trying to go for the scary yet impressive look. The plastic fangs can transform anyone into a Dracula wannabe! If that’s the effect you are going for, then that’s fine! But for those who want a more original and sophisticated look, the only option is the latest custom-made vampire crowns that are all the rage in the tinsel town these days. You will need to go to a dentist who is willing to give you some real vampire fangs, the kind that aren’t uncomfortable and stay put in your mouth. Imagine being able to eat and talk freely while sporting your favorite lifestyle. The dentist will custom make crowns for your canines. You can have them made as pointy, sharp and as big or small as you want them to be. They can even set you up with more vampire fangs on any of your teeth if that’s what you want. Remember those evergreen vampires in “An Interview with the Vampire”? 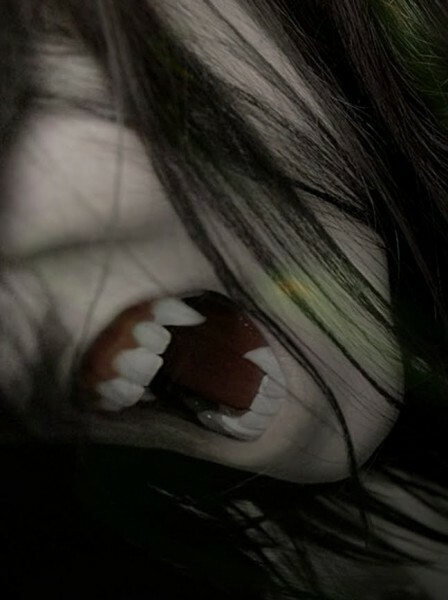 They had 3 rows of sharp fangs extending from the canines into the mouth. Our dentist can fix you up with those as well. All you got to do is ask! These teeth are actually porcelain crowns that are fitted on top of your real teeth. They can stay put for as long as you want them to. If taken care of properly, your new vampire fangs can last many years. You can choose to take them off whenever you want to. The only limit to the sizes and styles of vampire crowns is your imagination. But hey remember, just because you have custom made vampire fangs doesn’t mean these will be as indestructible as the real ones. Your real teeth should be in good health to withstand these vampire fang crowns in the first place. Next, it is imperative that you brush and floss your teeth regularly and take good care of them to maximize the life of your crowns. Many people just get the top crowns to minimize costs, discomfort and pain of the procedure. You don’t need to be bit to turn into a real vampire. Our dentists will do it for you! This article was posted in Custom Vampire Teeth and tagged costume shop, Dentist, floss, Teeth, tinsel town. Bookmark the permalink. Follow comments with the RSS feed for this post. Trackbacks are closed, but you can Post a Comment. ← Custom Made Vampire Fangs: Coming soon to a Dentist near You!